Can you find the elephant seal among the harbor seals? I prefer the companionable calm of harbor seals. Most people see these seals when they’re at their least attractive — lying like sausages on rocks or beaches as they do at Hopkins Marine Station. If you’re a careful observer, according to a Hopkins’ researcher, you can learn to identify high and dry individuals. But I prefer them in water when they’re at their most attractive. 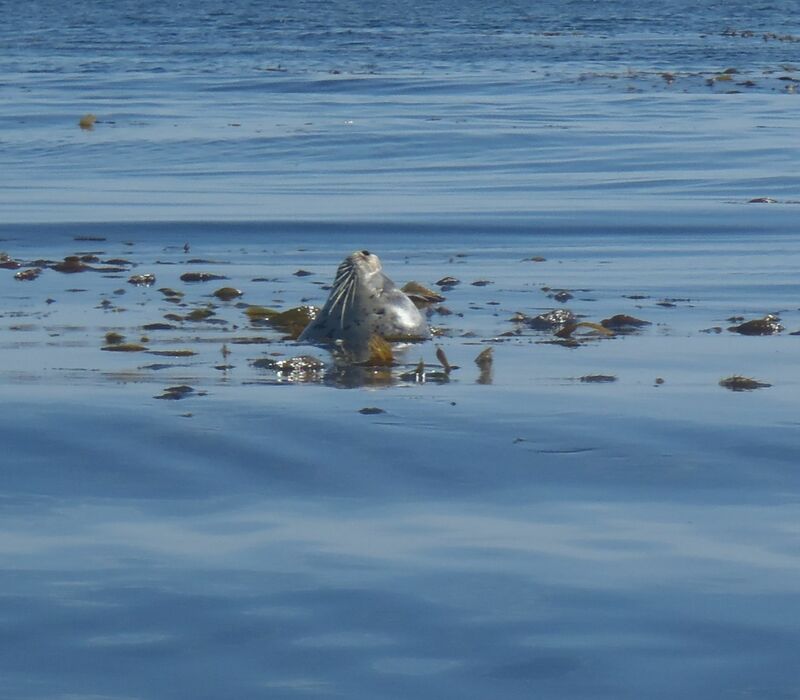 As I kayak, harbor seals are really hard to spot in the kelp. While snoozing, only the head or nostrils break the surface. The rest of the body is hidden below the canopy among the kelp. This position is called “bottling” (like a floating bottle). I’m often alerted to a seal’s presence by a snort or little splash as it submerges upon my approach. I know what you’re thinking: It’s illegal to get that close. I really try to follow viewing etiquette (and the law) and stay the requisite 100+ feet (31+ m) away when I see marine animals, but among the lumpy kelp canopy, harbor seals are nearly invisible. One time I got way too close, unaware. The harbor seal snorted, sunk, and then bumped my kayak, not once, but twice. Getting thumped by a harbor seal was a shock — they’re usually so shy. But this one was definitely telling me to scram. I’m now much better at spotting them and keeping my distance. Harbor seals are great to watch when they’re actively splashing, smacking the water or hunting. I’ve been surprised by a surfacing seal with a flapping fish in its mouth. It was comical — the fish was slapping the seal in the face with its tail. It appeared to be a rockfish, which along with flatfishes and cusk-eels are standard fish fare (according to Trumble 1995). With their big eyes harbor seals use sight to find food (as well as watch kayakers). Several studies (among them, Dehnhardt et al. 2001 and Hanke et al. 2012) have found that they also use their whiskers (vibrissae) to feel by direct touch and also feel water movements left by swimming fish. That would be comparable to you following someone based on the air movements left by their sashay. Wonder what worked best for the seal that showed me its meal. There are two great times to kayak among harbor seals. One is at night on a full-moon paddle in Elkhorn Slough. Stealthy seals follow the boats, and in the soft ethereal light you can hear their breathing. The other time is about a month after pupping season (April to June) when the new seal pups are exploring their world. (Note: It’s important to not disturb mothers or pups on pupping beaches.) Females feed their newborn for only about 4 to 6 weeks, then they’re on their own. In the water, the pups are shy, but very curious and follow my boat to check out one of the many creatures in their new world. Dehnhardt, G., Mauck, B., Hanke, W., et al. (2001). Hydrodynamic trail-following in harbor seals (Phoca vitulina). Science, 293, 102-104. doi: 10.1126/science.1060514. Hanke, W., Wieskotten, S., Niesterok, B., et al. (2012). Hydrodynamic perception in pinnipeds. In Tropea, C. & Bleckmann, H. (Eds. ), Nature-Inspired Fluid Mechanics (pp. 255-270). Berlin & Heidelberg: Springer. doi: 10.1007/978-3-642-28302-4_16. Trumble, S. (1995). Abundance, movements, dive behavior, food habits and mother-pup interactions of harbor seals (Phoca vitulina richardsi) near Monterey Bay, California. Master’s Thesis: Moss Landing Marine Labs, San Jose State University, CA. Retrieved from http://dspace.mlml.calstate.edu/handle/11028/149.